Just before I went to catch the 1pm David Copperfield performance yesterday, I was roaming around the downtown area in search of lunch. When I got to Liberty Square, I noticed there was a small set setup and it looked like they were going to film something. I wanted to stop and inquire about what was going on, but didn't want to be late for the show. After the show, I decided to head back and see if they were still there. 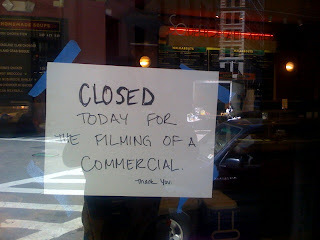 As luck would have it, the filming was in full swing. I was pretty psyched and when I asked which movie they were filming, one of the folks responded "It's a new Dunkin Donut's commercial." 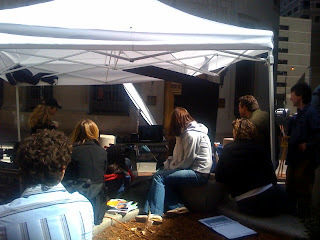 Ok so not as cool as if it was The Surrogates, but still neat to see them filming something. 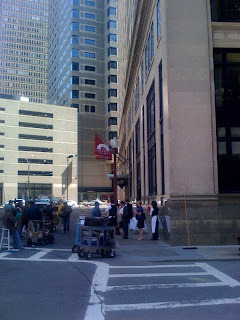 So be on the lookout for a commercial that seems to go like this: there's a business man and business woman walking down a sidewalk with a bunch of waiters and waitresses surrounding them handing them menus and other restaurant-related gear. 1 Response to "Dunkin Donuts Commercial Filming - 5/11"
Question - do you know of anything filming near Cleveland Circle in Brighton? This morning there was definitely something filming next to the Applebees in the park. There were tons of trailers, incuding one marked "Make-Up" and a big tent. I was on my way to work, so I didn't have time to investigate.